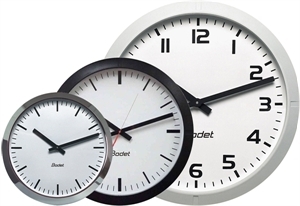 ► Clock with analogue display. ► Hour - minute or hour - minute and second display. control and automatic time set up. ► ABS casing IP 40, IK 02 (optional, reinforced protection «abattoir» IP55). ► Protective glass made with poly methacrylate. ► Casing colours: black, white, aluminium or chromium. ► Dial models: Arabic figures or minute notches. ► Wall bracket with optional locking system. Technical features : Injected ABS. Theft protection wall system. Chromium plated casing Wall bracket Double sided. Mounting for indoor and outdoor. Reception halls, offices, workshops, corridors, schools, hospitals, administrative buildings.